Disclosure: this post has affiliate links, which means if you purchase through one of these links, I get a few cents. 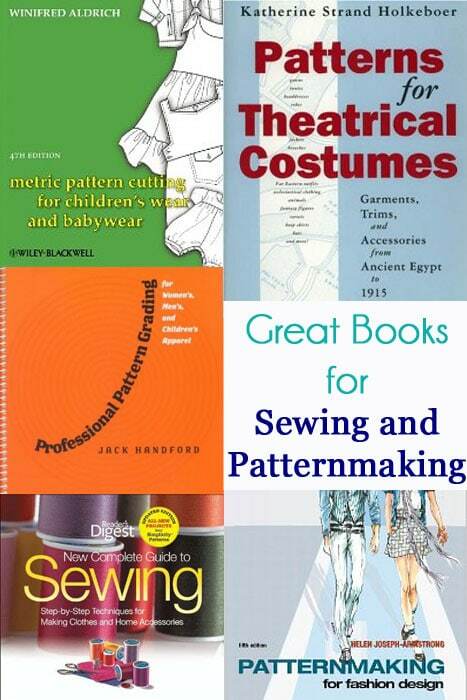 I’ve been getting a few emails lately asking about resources for patternmaking and drafting or sewing in general, so I wanted to share with you some of my favorite books. The internet is great, but sometimes you want something tangible to grab off a shelf whenever you have a question, and have the materials all in one place, instead of piece-mealing the information you need out of several online articles. So, here are books I love. Patterns for Theatrical Costumes (affiliate link) is the book I referenced in high school where I started learning patternmaking. It’s funny to me that theatrical costume and fashion design pretend to be two separate areas (they were separate programs in different departments at my college) when they’re doing essentially the same thing from the same bones. Anyway, this book doesn’t teach drafting, but it does show you how to create historical costume shapes. So I would enlarge the patterns in this book, then fit those basic shapes based on patterns that fit the actors in question. I didn’t know it, but that meant that I was using store bought patterns as slopers – which you can totally do! I didn’t even know the word sloper, but I made a lot of costumes and this method worked. If you’re looking to sell patterns and need to grade them, see if there’s any way you can lay hands on Professional Pattern Grading for Women’s, Men’s, and Children’s Apparel (affiliate link) by Jack Handford. It’s out of print and in demand, so used copies go for hundreds, which I realized after I managed to grab a copy. Sometimes you just need a general sewing reference. I own an older edition of The New Complete Guide to Sewing (affiliate link) – so old the binding is falling off. This new version also has home dec sewing, which I don’t think mine includes, so bonus! And finally, the first drafing book I owned, How to Make Sewing Patterns by Donald McCunn (affiliate link). This is not an easy to use book exactly, you cannot skip any steps, and the pictures/diagrams are not plentiful. BUT if you have a general idea about drafting, this book helped me get the most accurate slopers of myself that I’ve done, which I now use all the time. It does not include standard measurements or how to grade, this is strictly how to draft a custom sloper. But at around $20, it’s 1/4 or less of the price of the often recommended Patternmaking for Fashion Design (5th Edition) by Helen Joseph Armstrong (affiliate link). So there we go – 5 books that I actually use and refer to. Hope you find them useful as well. Great selection Melissa! I have the Helen Armstrong (3rd edition) from college, and use it all the time now when I’m making my patterns! I’ve also been trying to get my hands on the Winifred Aldrich for ages. You’re so lucky they have those at your library! For new sewers I always recommend: The Sewing Book by Alison Smith or Guide to Fashion Design by Connie Amaden-Crawford – They’re 2 of my favorites whenever I need a quick reminder. I have Helen Armstrong 3rd Edition and Winifred Aldrich metric pattern cutting for women. Need to get the professional book on grading now . Thank you for sharing this I had actually spent the last several hours looking over books for pattern making. I think I will be purchasing Professional Pattern Grading for Women’s, Men’s, and Children’s Apparel by Handford, since the third edition is a very reasonable 30ish dollars. I have the old Readers Digest Book that I begged from my mom since she had an extra (her mom had given her another copy) and it is my favorite sewing book. I love the Beach Dress/Changing Tent, anytime I am feeling blue about how a sewing creation turned out I just turn to that page and start laughing. I just realized the community college that is only a few miles from me has the Theater one so I only have 2 more books (the metric pattern cutting) and pattern making for fashion design to read before I have read your top 5. Thank you for putting together this resource it is nice know where to put a limited amount of money. Wondering how important you think it is to have the latest versions of the books, especially Pattern Making for Fashion Design. I already have the 3rd edition of this, so I’m kind of hoping that it hasn’t been updated too much. What do you think? Is it new information that I would be missing or more just updated illustrations?